Sipcast.Net enables you to establish an audio connection between two audio codecs via SIP, between two web browsers, or between an audio codec and web browser. Sipcast.Net is a highly-reliable cloud-based Internet service. It consists of an SIP media server that enables phone calls, of a web server for both configuration and WebRTC terminal devices, and a VPN server. Sipcast.Net must be available at all times. 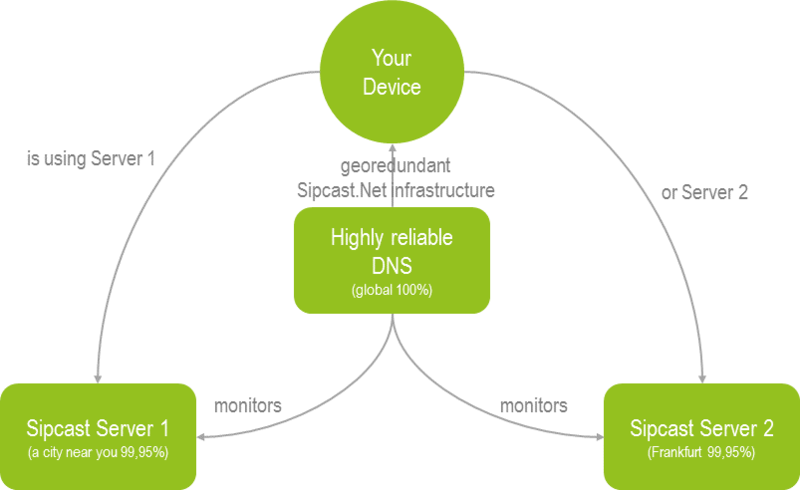 In order to guarantee the reliability of Sipcast.Net, we have established an easily-availabe and geologically-redundant server structure. The Sipcast.Net servers are located in two different data centres in two different places in Germany or a location near you. Each of the two data processing centres ensures us a 99.95% level of availability per year. However, a reliability of 99.95% is not sufficient for us. In order to improve their reliability, each of the servers is constantly monitored by a DNS and a monitoring service. The DNS service has not failed once in the last ten years; it works practically all the time. Should a Sipcast.Net server fail unexpectedly, the DNS service will notice immediately and change from one data center to the other. Thus, even in case of an unexpected server outage, the service delivery will continue within seconds. Furthermore, in order to allow you to monitor the availability of Sipcast.Net, we provide a monitoring interface at https://sipcast.symonics.com/api/health. A text file containing “GOOD” is returned if it works fine. We are continuously updating Sipcast.Net to ensure its reliability and security. We therefore have occasional periods of maintenance. We will inform you about such periods in advance and schedule them consistent with your plans. The EBU has established the standard Tech 3326 in order to make audio codecs by different producers function together properly via the Internet. Tech 3326 describes the products and encoding processes an audio codec must support. It regulates that the same processes be used as were used for Internet telephony and VoIP. With this, it relies on well-established processes such as SIP, SDP, RTP and UDP. 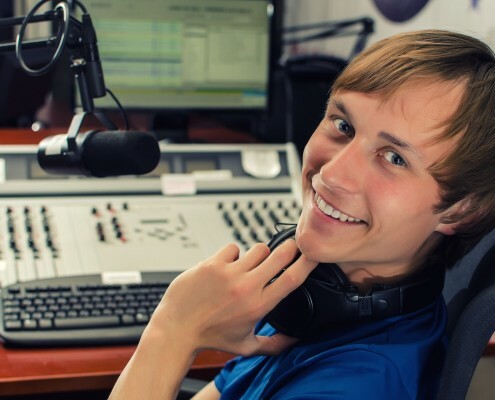 The Sipcast.Net service enables you to connect two audio codecs via the Internet. It makes sure that your audio codec is available via a Sipcast number. Should both audio codecs be connected after a NAT router, audio data will be transferred. The audio codecs themselves will remain accessible behind a strong firewall via VPN. A technological successor of SIP was invented in 2015. WebRTC is based on both SDP and RTP, but it is more secure and much more reliable, especially with firewalls and Internet connections with variable bandwidth. WebRTC is often implemented in web browsers because not even an audio codec or app is required to establish an audio connection. Sipcast.Net supports WebRT and is hence future-proof. It even allows EBU Tech 3326 devices to call web browsers. Investment in audio codecs will consequently remain secure. It is of highest importance to us that Sipcast.Net can be configured and used easily. You will find instructions and assistance in our FAQs. You are welcome to try out our service in advance using our free test accesses. Unfortunately, the devil is in the details. In case of problems, we are available to help you find the error. You can contact us via telephone or the contact form.